Take a card with no rules text and add rules text to it. Yar-Kul was transformed into a maggot then eaten by a frog wich swelled with the spirit to become Yargle. Hence, the alternate cost. 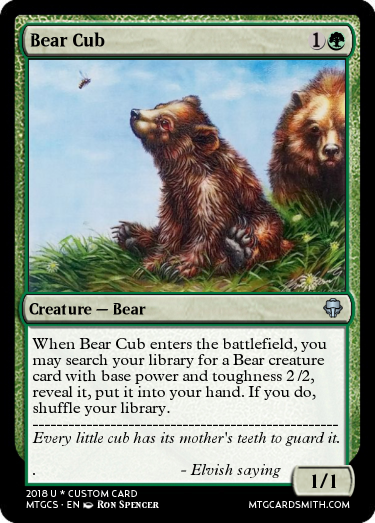 Use the flavor text to create the rules text. You can't change the name, mana cost, color IDENTITY, supertype, or subtype. Only change rarity and/or P/T if needed to balance. Please use original art. 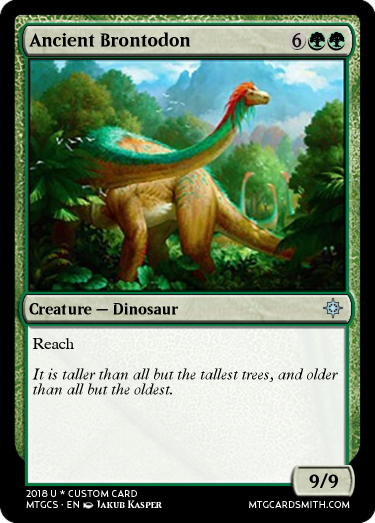 Post the image of the original next to the card with rules text. And explain the connection between the flavor text and the rules text. Cards will be judged by how much the rule text fits with the card and the flavor text. Here's Mine and the Old one. Here's my entry, featuring the lord of triple green (before that steel leaf upstart came along). You can give it hexproof because its thick hide helps it shrug off spell attacks. 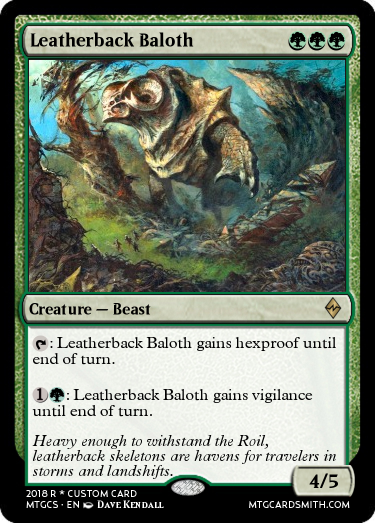 It can literally withstand the Roil (http://gatherer.wizards.com/Pages/Card/Details.aspx?multiverseid=451047). You can give it vigilance because... okay, that's because it lets you mess around with the tap ability and I like that kind of thing. Now this Skaab with its awesome artwork finally gets an ability it can be proud of. Ludevic and Geralf are necromancers. Necromancers are (mostly) wizards (those two are). 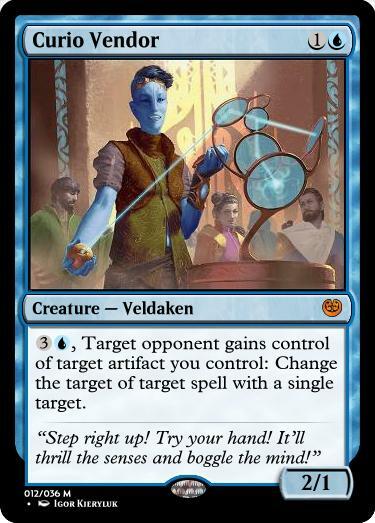 So, if Geralf made this Skaab, Ludevic can now spend a turn turning it into something even better! 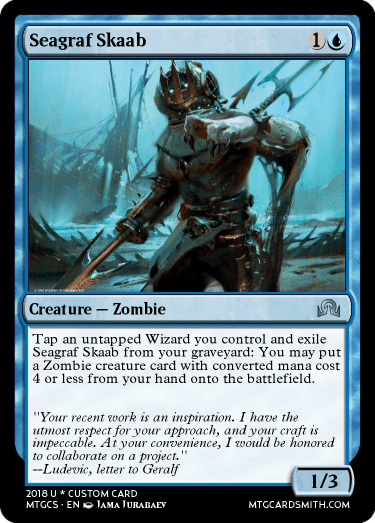 Featuring the original Innistrad's Skaabs' ability to exile creatures from your graveyard to be cast. This seems cool! Here's mine! Ridiculed for just being a vanilla 2/3 for 3, the Tolarian Scholar decided to actually get some abilities. Sorry if it's fuzzy. I don't know how to fix that. 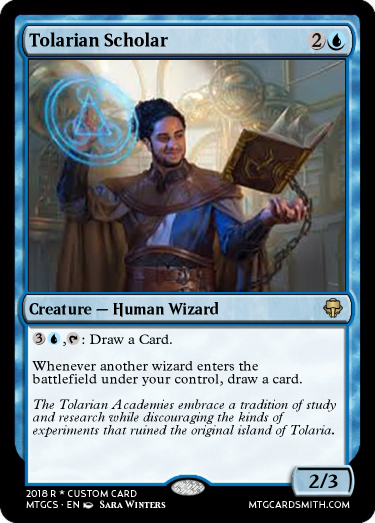 Anyways, a tradition of study and research means drawing cards, and he also works with other wizards to make sure that the new Tolarian Academies don't suffer the same fate as the original, hence the second ability. Right. I forgot about the set symbol. I may be getting premium sometime soon, and then I can fix it. @bigbadbooknerd, you should use gatherer for card images/links. "Use the flavor text to create the rules text. You can't change the name, mana cost, color IDENTITY, supertype, or subtype. Only change rarity and/or P/T if needed to balance. Please use original art. " Here's another one. Here comes Gregory. He should have always had reach. It just makes sense. I liked the card, but thought it could use a bit more to it. You can't use that card. The original has rules text. @sorinjace, don't alter the flavor text. Sorry about that. Must have misread the rules. I have another entry though. 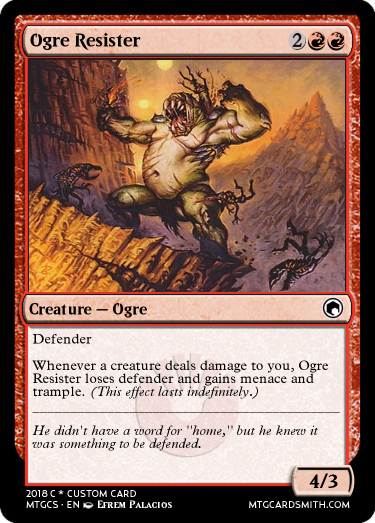 1st we have @TheCenterOfTheUniverse with Ogre Resister. 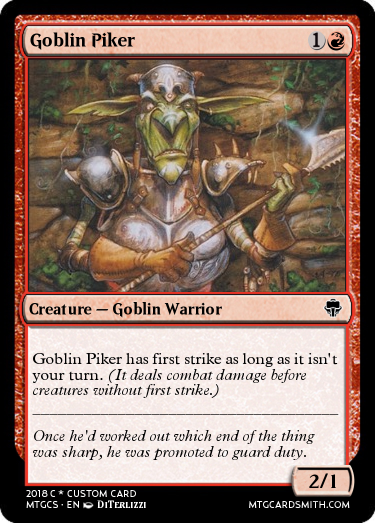 2nd we have @saveria201 with Goblin Piker. Ancient Brontodon by Aggroman15 and Tolarian scholar by Aggroman. @TheCenterOfTheUniverse and @saveria201, give me links to the cards you want me to fav. Hm. 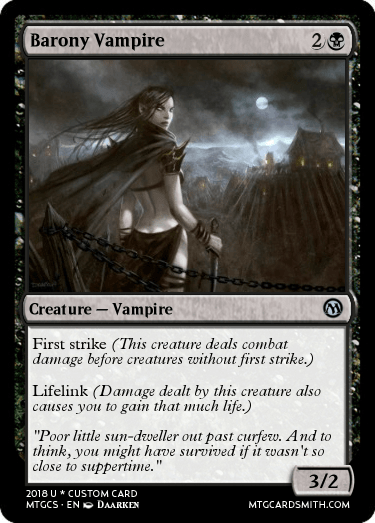 Didn't Barony Vampire disregard the "explain the connection between the flavor text and the rules text" part of the contest rules? I'd really like to see that explanation.